After thirty-six years in the museum field, Ron McCarty has specialized in painting botanical and wildlife subjects executed in watercolor in a realist technique. His work has been displayed in museums and fine art gallery exhibitions in Paris, London, New York, Washington D.C. and many museums in North America. Ron was included in the 6th International Exhibition of Botanical Art and Illustration at Carnegie Mellon’s Hunt Institute and one of his paintings was featured as the cover illustration of their exhibition catalogue. The Hunt Library is the largest and finest botanical collection in the world and has two of Ron’s works in their collection. 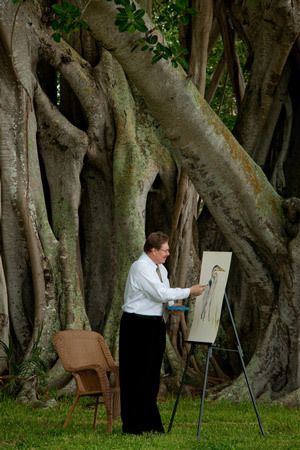 Ron is Curator and Keeper of the John and Mable Ringling’s historic mansion, the Ca’d’Zan in Sarasota, Florida. He has published with Scala Publishers in London, Acanthus Press in New York, and has authored numerous museum publications. His watercolors are often painted on vellum or parchment purchased in England. He paints in the technique used by the most famous botanical artists of the 18th and 19th centuries, using very fine brushes and layering colors to give brilliance to the flowers’ details.